Name Normand Master Type AHTS Yard Ulstein Owner Solstad Normand Master, a massive 23.500-hp anchor handling tug supply vessels (AHTS). was delivered March 28. 2003. Normand Master, hull no. 265. was designed by Ulstein Design AS (type A101) and was built by Ulstein Verft AS for Solstad Shipping ASA. While the vessel is nearly identical to the trio of ships that preceded it. it does boast one major design modification: a massive Aframe. 250-ton deck crane bolted on the aft deck. Arguably, the heart and soul of vessels of this genre are in the amazing packages of deck machinery, and here again Normand Master stands tall. The impressive list of deck machinery, designed to enable it to carry out a multitude of functions, from anchor handling in deep water to supply services to subsea operations, includes: a 500-ton winch; two combined Windlass/Mooring Winches; a 15-ton pull mooring winch; two 22-ton pull tugger winches; two 15-ton pull Capstans, aft: two towing/working drums with spooling gears, with a capacity of 2,700 m of 83 mm diameter wire: one anchor handling drum with spooling gear, with a capacity of 2.000 m or 109 mm diameter wire in five layers: two secondary winches with spooling device, and a 170-ton pull capacity; One storage winch for spar tow wire; twin stern rollers; two retractable anchor handling forks; and two sets of retractable towing pins. Power for all operations is entrusted to Finland's Wartsilii. which supplied four main engines, each rated 4,320 kW at 750 rpm. The series from Ulstein is a victory for its Ulstein Design, which was started in 1999 as a department of Ulstein Verft in the series of dealings that saw Viekers PLC and eventually Rolls-Royce end up with the popular "UT" line of vessels in its stable. Ulstein Design became a separate company in 2002, and to date the company has seven vessels from its design stable delivered. Name Type Yard Owner LA Fireboat 2 Fireboat Nichols Brothers LA Fire Dept. The Los Angeles Fire Department (LAFD) has accepted its new fireboat, L.A. Fireboat 2, which is the largest in the U.S. according to its length of 105 ft. (32 m) and a fire-fighting capacity of more than 10,300 cu. m./hr. It was designed by Robert Allan Ltd, and constructed in 18 months by Nichols Brothers Boat Builders. Propulsion and steering control are provided by twin Voith cycloidal propellers, Model 26 GII/165, provided by Voith Schiffstechnik, each driven by an MTU/Detroit Diesel Model 12V4000 diesel engine, rated 1,800 bhp (1,343 kW) at 1,800 rpm, which also drive a fire pump through a front end PTO. In addition, a pair of MTU/Detroit Diesel 8V-4000 pump engines each drives two fire pumps. All machinery is resiliently mounted for minimization of noise and vibration transmission. The fire-fighting system delivers a total of 36,000 U.S. gpm at the system operating pressures of approximately 10 bar (136,080 lpm or 8,165 cu. m. /hr.) delivered from a total of six pumps to all the monitors. The entire fire-fighting pump and monitor system was provided by Unitor AB (formerly Svenska Skum AB). The wheelhouse is designed to provide maximum possible all around visibility, with excellent overhead visibility through large visor windows. To keep a clear view, it is outfitted with a Wynn wiping system. Name HOS Bluewater Type OSV Yard Leevac Owner Hornbeck Offshore Services Hornbeck Offshore Services (HOS) took delivery of the HOS Bluewater from Leevac Industries LLC. Designed by and built for Hornbeck Offshore Services. LLC, the HOS Bluewater is the company's seventh DP-2 vessel. HOS Bluewater measures 240 x 54 x 19- ft. The latest of the HOS "New Breed" has been uniquely engineered to offer numerous advantages over existing tonnage. The unique hull form assists in making the Bluewater a very DP capable and fuel-efficient vessel. The vessel is certified to both USCG Subchapter L (OSV) and I (Freight and Industrial Service) and is fully SOLAS for international operation. The American Bureau of Shipping has classed the vessel as +A1. +AMS. +ACC. DPS?2. Offshore Support, Oceans. Two (2) Caterpillar 3516 B main engines produce 4.000 blip, which drive two 96-in. Scana Volda CP propellers. Three 800-hp CP tunnel thrusters (two forward, one aft) are provided by Brunvoll for a total of 2.400 hp. Two Van der Velden "Fishtail"-type rudders operate independently to provide superior maneuverability and vessel control. With improvements over previous OSV's. the design offers optimum deck space and load capabilities. The vessel's deadweight is 2.758 long tons that can be offloaded with state-ofthe- art pumping systems featuring positive displacement pumps. The clear deck area for cargo loading is 175 x 45- ft. with a cargo capacity of 1,725 long tons and a deck rating of 1.024 Ib./sq. ft (5 mt/sq. m.). HOS Bluewater is engineered for maximum loading capabilities. Navigation equipment includes the JSPD P5000 DP system provided by Nautronics. The electronics suite selected by Hornbeck Offshore and installed by Beier Radio offer the crew state-ofthe- art tools needed to operate safely and efficiently Name OJ Cenac Type Ocean Tug Yard Main Iron Works Owner Cenac Towing O.J. Cenac is a big boat, at 130 x 38 ft.
with a 15-ft. molded depth. The new boat marks a milestone for both Cenac and Cummins as it is the first tug into service with Cummins' new QSK60 engines. With three of these new engines, each turning its own propeller, the O.J. Cenac. will work as an 8,000-hp classed vessel. The engines turn into Twin Disc MG DR5600 marine gears with 7:1 ratios. The 90-in. props are enclosed in kort nozzles that have been faired into the hull to maintain the boat's 12-ft. working draft. The massive props are mounted on nine-in. shafts equipped with Kobell 527A shaft brakes. Steering to the boat's three rudders was supplied by St. Rose. La.-based EMI. The electronic clutch and throttle controls were supplied by Twin Disc. There is an Alfa Laval SB 104 centrifuge through which fuel is pumped. The centrifuge is also employed to circulate fuel in the tank. Accommodation for a crew of up to 12 people is provided in a traditionally styled three level deck house. Auxiliary power employs two Cummins 6CT-powered 130 kW generator sets in addition to a Cummins QSMI1 for the boat's Intercon winch. The waterfall-type winch has a capacity of 3.000 ft. of 2.5-in. wire per drum and 315,000 pounds of line pull. The boat has a fixed onboard C 0 2 fire suppression system for unmanned machinery and cargo spaces and is built to an ABS load line but is not classed. The boat will tow a 425 by 70-ft.
50,000-barrel barge in deep water Gulf of Mexico service. Leroy Molaison, of Main Iron Works in Houma, explains that this boat is one of 20 or 25 vessels the two companies have collaborated on. Name Type Yard Owner Seacor Madison Supply Boat Bollinger Seacor Marine Seacor Madison, the first of three 207- ft., 4,750 bhp supply boats, was delivered to Seacor Marine, Inc., from Bollinger Shipyards, Inc. The boats are part of Bollinger's new 220 Class OSVs. vessels designed to raise versatility and cargo carrying capacity, while lowering operating costs. Overall, Seacor Madison is 207-ft.
long, 53-ft. wide and 19-ft. deep. Light draft is 6.5 ft.; loaded draft is 16.2 ft. A pair of Caterpillar 3516B diesels developing a total of 4.750 bhp at 1,600 rpm driving two Steerprop SP25 azimuthing propulsors supplied by Karl Senner. Inc, provide propulsion. Two 370 kW generators driven by two Caterpillar 3408 diesels produce electricity. The boat is also equipped with a 95 kW generator as part of its Safety of Life At Sea (SOLAS) classification. Two 1.000 hp SMI bow thrusters driven by two Caterpillar 3508B diesels aid maneuver- ability and station keeping. Bow thruster noise is reduced by a Sound Down noise damping system. All of the Caterpillar engines were supplied by Louisiana Machinery, Inc. Her cargo deck has a clear area of 6,525 sq. ft., capable of carrying 1,380 long tons. Other equipment includes six (6) 16-man inflatable life rafts; a SOLAS rigid inflatable boat (RIB) with a 50 HP motor, and a Headhunter 36- person marine sanitation device. Airconditioned and heated accommodations are provided for 26 people in 11 cabins, all with private heads. A double bed hospital is also included and the boat's galley can serve 12 persons at a time. Seacor Madison is U.S. flagged and classed by the ABS Maltese Cross Al, AMS, DPS2 and documented by the U.S. Coast Guard under sub-chapter L OSV & I Misc. Vessel and carries full SOLAS certification. Name Type Builder Owner Viking Energy OSV Kleven Verft Simon Mokstor A landmark decision to use liquefied natural gas (LNG). instead of diesel oil, to fuel a new class of offshore support vessel has taken operational form on the Norwegian continental shelf after a three-year development process. The platform supply ship Viking Energy is the result: a versatile, sophisticated vessel promising much reduced environmental impact. The vessel is expected to yield about 200-tons less in oxides of nitrogen (NOx) emissions every year compared to a ship burning oil. In addition, carbon dioxide release should be significantly reduced. Charterer Statoil, which has made a 10-year commitment to Viking Energy and to a second such newbuild from west Norwegian shipbuilder Kleven Verft. can use the savings in pollutant emissions as a quota to offset other operations. Under an agreement between the energy group and the Norwegian authorities, emission reductions achieved with the new vessels can be credited to Statoil-operated facilities on the Norwegian coast, where Nox curtailment measures cost much more. The Eidesvik-owned Viking Energy, and the sister newbuild contracted by Simon Mokster Shipping, are based on the VS4403 design developed by consultancy Vik-Sandvik. The vessels will be deployed out of the Coast Center Base near Bergen, supplying consumables, materials and equipment to oil and gas installations in the North Sea. The ships have a deadweight of 6,013-tons at the summer draft of 26 ft. (7.9 m), and offer a large open, working deck plus a diverse underdeck storage capability within main dimensions of 308 ft. (94 m) in length with a 67 ft. (20.4-m) beam. Each is installed with four main generator sets, individually rated at 2,()l()-kW. supplying electrical power for propulsion and shipboard services. ABB was entrusted with the electrical system, and the prime movers for the gensets are six-cylinder Wartsilii 6L32DF dual-fuel engines, conceived to ingest gas or oil in any proportion. While employing the gaseous fuel at low pressure, reliable ignition will be ensured by injecting a minute quantity of diesel oil directly into the combustion chamber as pilot fuel. For minimum emissions, the vessels will run on LNG. but should the vessels move away from an area where gas can be bunkered, the engines can operate on diesel fuel. LNG is contained in stainless steel, horizontal tank protectively located in the middle of the vessel. It comprises an inner and outer chamber, and employs a gap of 300-mm between the two, maintained under a high vacuum to insulate the LNG at minus 162-degrees Centigrade from the surroundings. The liquid gas is vaporized for delivery to the engines at about 20- degrees C and 5-bar pressure. The endorsement of such a system through these bold investments can be expected to stimulate interest in the uptake of the technology across a broader front in the shipping industry. Name Jane A. Bouchard + Barge B No. 225 Type ATB Builder Bollinger Owner Bouchard Bouchard Coastwise Management added to its fleet a double-hull articulated ocean-going tug/barge units (ATB) with the delivery from Bollinger Shipyards. Inc.. Lockport. La., of the 130-ft. tug Jane A. Bouchard and the 430-ft.. 110,000 barrel (BBL) class double-hull oil Barge B. No. 225 that meets the requirements of the Oil Pollution Act of 1990 (OPA '90). The Jane A.
Bouchard and Barge B. No. 225 is the first of a two ATB contract between Bouchard and Bollinger. The second, planned for delivery in May 2004. will be the sister ship. Morton S. Bouchard IV and a larger. 487-ft.
barge B. No. 242 capable of carrying 135,000 BBL of clean petroleum products. The Jane A. Bouchard was built at Bollinger's Lockport, La., shipyard and the Barge B. No. 225 was built at Bollinger Gretna, in Harvey, La.. Joined together by an Intercon coupler system, they form a 520-ft. ATB unit capable of carrying several types of petroleum products. Jane A.
Bouchard is 130-ft. long with a 38-ft. beam and normal operating draft of 19-ft. Maximum draft is 22-ft. It is powered by two channel cooled GM EMD 16-645- F7BA diesel engines developing a total of 6,140 bhp. They drive two Bollinger manufactured five-blade, 140-in. diameter by 94-in., manganese/bronze propellers through Reintjes WAT 3455 reverse/reduction gears with a ratio of 4.480:1. Three Detroit Diesel 8V- 71 engines driving three Baylor generators develop a total of 297 kW of electrical power. The engines are started by Quincy air compressors and monitored by an EMI 72-point system. A Sperry Marine electro/hydraulic system steers the tug. The tug's deck is outfitted with an Intercon single-drum hydraulic tow winch, forward and aft vertical electric capstans and a rescue boat and davit. The Intercon coupler system has two electric rams that lock into a rack or ladder at the notched stern section of the barge that when the tug and barge are locked together, keeps each of the two units rigidly in place. Name Laney Chouest Type OSV Builder North American Shipbuilding Owner Edison Chouest Offshore Laney Chouest at 348- x 72- x 31-ft. is an offshore supply vessel, the king of all tugs in the Gulf of Mexico. It was built by the North American Shipbuilding, a part of Edison Chouest Offshore, Galliano. La. who also owns and operates the vessel. The vessel is efficient since it is designed to do several jobs that formerly needed separate vessels For example, the vessel will set suction piles that anchor floating oil production facilities to the seabed using the largest tow winch every built. The vessel is also a supply boat with below main deck tanks to hold 337,791 gallons of fuel oil, 663,169 gallons of rig/ballast water, 7,367 barrels of liquid mud, 42,332 gallons of potable water and 12,583 cu. ft. of dry bulk material delivered at 80 psi. The Laney Chouest also is a major cargo carrier. The rear deck measures 183.5 by 56 ft. and can hold 3.000 long tons of cargo. In addition, the vessel has an ROV to support suction pile placement and other sub sea construction work. A 42-in. diameter moon pool is included for keelhauling objects. Two 20-ton cranes and a 2.5-ton crane assist in the suction pile placement and other subset work. The Laney Chouest also has a 350 metric ton A-frame with a 2.0 metric ton crane attached. Power for the Laney Chouest is from a quartet of Caterpillar-MAK 6M43 diesels generating a total of 29,000 hp. Each of the engines drives a 3.5-MW shaft generator used to power the thrusters. The four engines are setup in an arrangement so that a pair of engines each power 4,700 mm propellers as well as two shaft generators. Three Caterpillar 3512 engines provide 1.300 kW each of ship's power and a 3406 Caterpillar engine produces 300 kW of emergency power. The 348-ft.
Anchor Handling Tug Supply vessel (AHTS) Laney Chouest during final outfitting at North American Shipyard. The vessel will provide charterer Shell Oil Company with a multipurpose vessel to set suction piles, carry huge amounts of liquids in her below deck tanks and 3.000 long tons of cargo on her aft deck. Owned and operated by Edison Chouest Offshore. Galliano. La. this vessel also carries an ROV and several cranes for construction work. It is the largest offshore vessel yet built and is powered by four Caterpillar-MAK engines generating 29.000 hp. Name Seabulk South Atlantic Type AHTS Builder Brevik Owner Seabulk The Seabulk Offshore group of companies has decided to add a new UT-710 Anchor Handling Tug Supply Vessel (AHTS) to its fleet, making the 226-ft.
Seabulk South Atlantic the fifth newbuild vessel in Seabulk's 2003 fleet renewal program. Built by Norway-based Brevik Construction, the l(),050-hp Seabulk South Atlantic joins the fleet on a fiveyear bareboat charter agreement that includes an option to purchase at the contract's end. Seabulk South Atlantic, which moves at speeds up to 15.5 knots, has a certified bollard pull of 133 MT, and provides a large triple-drum anchor handling/tow winch with up to 300 tons line pull and 450 tons brake load. The vessel also has a large 123 x 50-ft. deck that can handle up to 800 tons of cargo. The UT-710. which was designed by Rolls Royce Marine, incorporates a substantial amount of that manufacturer's equipment, including the main engines, thruster. rudder, and automation and control systems. The vessel is also fitted with high Liquid Mud and Brine capability in addition to FiFi 1 class notation and Dynamic Positioning DPI. Resulting from its versatile capabilities, the vessel can therefore serve in a multiple support role assisting heavy-duty semi-submersible rigs for exploration and development drilling, as well as fulfilling the steadily growing demand for offshore terminal support work. Name Levanto Secondo Type ASD Tug Builder Damen Owner SCAFI Levanto Secondo is a Damen Azimuth Stern Drive Tug 2810 delivered in October 2002, to SCAFI, an Italian operator. The design of the Azimuth Stern Drive 2810 has been completely prepared to comply with U.S. tonnage rules and USCG-requirements, so that it can be of interest and use to the U.S.
market as well. Levanto Secondo is the second vessel of this type, ordered by SCAFI. and it will be used in the harbor of La Spezia in the northern part of Italy. The ASD Tug 2810 has a round bilge hull with a transom stern and a rounded bow. The transom corners are well rounded and the forecastle gives sufficient bow height for severe working conditions. The hull is divided into five compartments and features 10 mm side and bottom plating, and 8mm deck plati ing. Bottom plating in the thruster area is increased to 12 mm, and the sheerstrake has a plate thickness of 15 mm. A pair of nine-cylinder Wartsilii 9L20 engines (1,620 kW (2,172 bhp) at 1.000 rpm each) power Levanto Secondo, driving Schottel SRP 1212 thrusters, with CP propellers. On the fore deck and on the aft deck Kraaijeveld towing winches are fitted. The brake holding power of both winches is 130 tons, and both winches have stainless steel rims with band brakes and friction clutches. The fore winch is of the single drum type, suitable for 150 m synthetic rope of 80 mm diameter. The pull of the fore winch is 10 tons at 20 m/min., or 20 tons at 10 m/min. The aft winch can store 200 m synthetic rope of 80 mm diameter and has a pull and speed of 10 tons at 20 m/min or 20 tons at 10 m/min. The ropes used on the fore and aft winch run through stainless steel triangular fairleads integrated in the towing bitt. On the aft deck a Kraaijeveld capstan of 3.5 ton pull is arranged, and a Mampaey towing hook of 65 ton Safe Working Load is fitted. Name Type Builder Owner Mm CS June K Tug A+B Kosnac Kosnac Floating Derrick Corp. of Staten Island, NY took delivery of the 2,700 hp June K, the company's first twin-screw tug and its first new build after three generations of Kosnac family management. "We took everything we learned from 75 years of using other peoples' boats in New York waters," said Capt. Fred Kosnac, "and put it into a design specifically adapted to the wideranging conditions of New York harbor and the rivers that flow into it." The 78 x 26 x 10.5 ft. tug. with twin CAT 3512B diesels and a 9-ft. draft, was built by A&B Shipyard. Amelia, La. It is the first of three in Kosnac's current building program. Intended principally for ship handling and assist work, barge towing and dredge assist, the June K's draft is shallow enough to navigate the many creeks and estuaries throughout the Port of New York region. To meet the environmental requirements of waterways further upstate, the tug is fitted with a gray water discharge holding tank. The June K's upper pilothouse, with a maximum eye-height is 28 ft., can be folded aft to clear lower bridges around the Port of New York and further upriver. In its collapsed position, the view is from a 19-foot eye-height. Whereas a stock tug of similar design has a normal capacity of six crew, the June K's is increased to eight for tasks requiring it. "New York can go from the near-arctic to the sub-tropical," said Capt. Kosnac, "so with crew comfort in mind we've added extra insulation against heat and cold, as well as against noise." The June K. is fitted with a 5-ton central air conditioning system. To further control discharge, the propeller shaft glands are packed with W.L. GORE & Associates. Inc. GFO Marine Pack packing material which will leave a nearly dry bilge. "She can be completely discharge-free wherever required." said Capt. Kosnac. Name Type Builder Dixie Patriot Liftboat SEMCO Dixie Patriot is a new super capacity lift boat built by SEMCO, LLC, Lafitte, La. "This is the world's largest lift boat, anyway you measure it from leg length, total HP or size of work platform, said George Marcel, shipyard representative for SEMCO LLC. 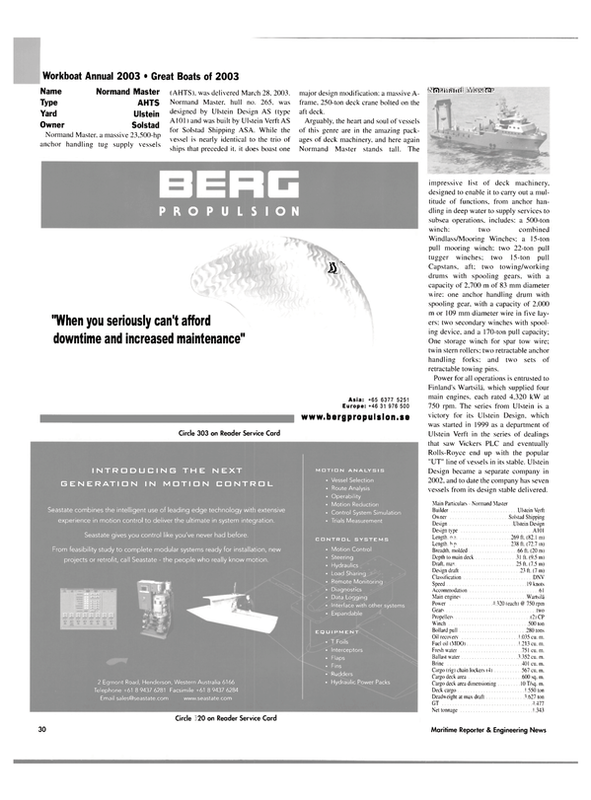 as reported in MarineNews, sister-publication to Maritime Reporter & Engineering News. It measures 176.5 x 113- ft. wide with a 13- ft. deep hull. Three legs. 280 ft.
long and 8.5 ft. wide can be lowered up to 200 ft. in the water. In shallower waters. (100 ft.) the hull can be lifted (or "jacked up") 100 ft. above the waterline to work on tall platforms. Propulsion is from a pair of 1.500 hp Caterpillar 3512 engines driving Twin Disc gears and spinning Kaplan stainless steel 79-in. diameter props. Dixie Patriot uses a pair of Caterpillar 831 hp 3412 DITA engines that drive six jacking pumps that power the hydraulic motors located in each leg. These motors power the motion of the 280- ft. long legs. Controls for the propulsion engines and the hydraulic lift controls is by Engine Monitor. Inc.. St. Rose. La. The engine room also contains a pair of Caterpillar 3412 engines each producing 425 kW of electricpower. Some of the electricity is used to power a 500 hp SMI bow thruster. An emergency generator is housed in an enclosure on the 03 level. A Caterpillar 3306 genset provides 190 kW of emergency power per ABS guidelines. The outstanding feature of the main deck is the two cranes that are installed around the two jacking legs at the bow. Each crane can lift 200 tons and have a reach of 140 ft. When the cranes are not deployed they lie on supports on each side of the super structure "pointing" at the heliport that can land a Bell 212 copter or equal.